One of the first games we teach our children is to build blocks up into a tower. Actually, let me correct that. One of the first games our children learn is to knock a tower of blocks down. Not quite the game that we have in mind but one in which every child takes delight, and is it any wonder? The adult does all the work, carefully balancing blocks on top of each other before the child lashes out with its hands to send the blocks scooting around the room. We cheer and clap this amazing feat of coordinated destruction before scrambling across the floor to gather up the blocks and repeat the whole process. What a genius that child is! When my children were toddlers they had a flat bed truck filled with gorgeous wooden blocks in different colours and shapes, the truck doubled as a walker, their weight as they lent on the handle would create a momentum that pushed the truck forward. Both of the children would spend minutes at a stretch (we are talking about toddlers, their attention span doesn’t last beyond minutes) building them into pseudo-Greek structures before knocking them over and commencing the re-construction process. Eventually they would tire of the game and start throwing the bricks around the room, somewhat surprised when they didn’t get a round of applause for their behaviour. As the toddlers turned into little girls and boys we introduced Lego to them. Now, Lego is one of the most enduring, ageless and inspirational toys. I would say gender neutral as well, but now that Lego has introduced Disney Princess sets and the Lego Friends kits this is, sadly, no longer applicable. Just the other morning J was complaining about the fact that T had a Lego set that was far cooler than his because it had a treehouse and zip wire to build. This then prompted a half hour discussion about why he felt he couldn’t play with / buy this particular set and why was it just for girls because at the end of the day the product inside the box was still just a pile of blocks and that it was just the marketing on the box that led him to believe it wasn’t for him. This conversation makes me feel sad as I spent hours and hours of happy play back in the early 80’s with my best friend (a boy) and my brothers (boys) playing with Lego sets that were just as good for a girl as they were for a boy. Indeed I am sure that the thought that one or the other of us shouldn’t have been playing with the Lego never entered our subconscious, let alone our conscious thought processes. Anyway, I digress. Lego, as I was saying, is one of the most enduring, ageless and inspirational toys ever to be created. The best thing about Lego is that it is also evolving and moving with the times. Lego doesn’t just produce plastic bricks it is involved in the development of social skills, encouraging learning through play, introducing science and robotics whilst harnessing the importance of coding. All of this combines to allow the children of today to develop into adults who will become the engineers who shape the technologies of the future. This is quite incredible when you think of Lego’s humble Danish beginnings. The Life of Ryrie family, LOVE Lego. We aren’t fanatical about it, it isn’t the only toy in the house, we just enjoy the creative opportunities that are presented with each pile of bricks. The opportunity to create something that is unique to ourselves (yes it might be a house, but not made with THIS combination of bricks/colours). Over half term we didn’t plan to do a lot, apart from a trip to Brick Live! If you have children needing to understand the concept of heaven, just take them to Brick Live! an exhibition ‘Built for Lego Fans’. This is their Valhalla, paradise, Shangri-La, whatever you wish to call it. We went to Brick Live! 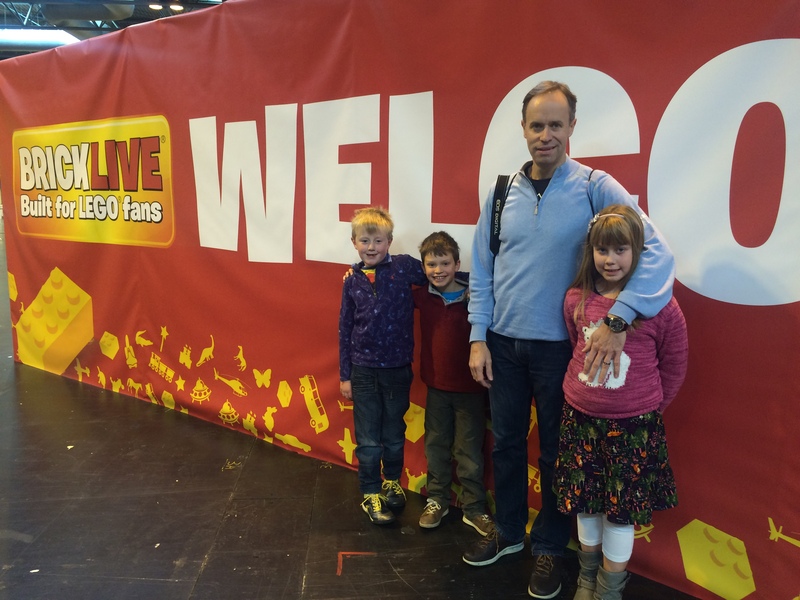 at the NEC in Birmingham, just a short 2 hour drive from our home, with T, J and J’s friend H. The children were beyond excited as the day promised to be one huge Lego fest. Talks, demonstrations, fan zones, stalls for every conceivable Lego purchase, movie showings, a dance zone, and, quite possibly the best attraction ever, massive brick pits in which to sit and build. J now wants us to take up the floorboards and convert his bedroom floor into a massive brick pit. Whilst I’m up for considering most of my children’s decorative suggestions this is definitely one step too far! The exhibition was a manageable size, it was large but not so large you felt as though you would get lost, it was busy but wasn’t so busy you had to queue to get to the brick pits. It was the perfect size for children. The longest queue we encountered was the one to get into the Toys R Us stand which was packed with Lego sets, some of which had special show discounts. My only criticism was that there weren’t really any pocket money kits, as always with Lego, £5 doesn’t exactly go very far which was a shame for the three children with a small amount of money burning holes in their pockets, and an even bigger shame for the adults as we ended up supplementing their monies. When I was a child I remember the great excitement in spending my couple of pounds on a rubber, pencil and sticker at The Royal Tournament exhibition but this kind of merchandise didn’t seem to be available at Brick Live! and I guess that the children wouldn’t have been overly chuffed with a sticker when what they really wanted was the Sydney Opera House (NB – we did NOT purchase the Sydney Opera House). The highlights from Brick Live! for me included the Lego Art gallery, and the Fairy Bricks collaborative project. For the children it was the brick pits closely followed by the PlayStation 4’s Lego Star Wars games stations, the Lego map and the Fairy Bricks project. T had also wanted to find out more about the First Lego League (for 9-16 year olds), which is an initiative that combines Lego, science and robotics, unfortunately those sessions were fully booked for the duration of the day (top tip, go and register to participate as soon as you arrive if you attend the next Brick Live!). Another top tip would be to take plenty of water and your own picnic lunch like we did, as with all these types of exhibitions, the food stalls were expensive, especially if you are trying to feed a family of five. We left the NEC tired but incredibly happy, our heads full of the amazing creations we had seen and the projects we had participated in. It was the perfect Lego day out and even more remarkably no one had stood on a brick.